The planet Zunen was a middle class planet and a place where about one and a half million Zunenians lived in. I say it was, because it’s been a long time since my visit, and I don’t know what the situation of it according to the earth time right now. I had first met with the name of the Zunen planet in the Humok library. This planet, which has a rich source of mineral fluids, made its living by exporting it to other planets in its galaxy. Of course the rules of the Galactic Council are not allowed me to explain the coordinates of the planet in here. But it’s okay to say that Zunen is not in the same galaxy with the planet Earth. According to what I’ve read about Zunen at the Humok library, perhaps the happiest living things in that galaxy lived in Zunen. Besides the task Galactic Council gave me, after reading these, I knew that I had to visit them. Because there is a serious chaos in the whole universe, and visiting such planets always raises hope. – What I’ve read and heard about Zunen was right. It is a fact that these beautiful flowers, especially after my long journey, cheered me up and put me in a higher mood. -Flowers are just flowers, the journey is also only journey, mood is … hmm, I don’t know what the mood is. Anyway, while you’re here, you should not to use adjectives. If you make your sentences in this way, it would be thing. In these thing days, when our economy’s thing situation has reached the level of things, at the economic thing’s meeting, spokesman of the economy ministry said, “In order to do a thing, the next thing we will do is to keep them under the thing way”. – Zunen’s foods are also thing. This planet is where Korazl is always thing cooked. If I don’t make Korazl to you, it means that I’m not a thing Zunenian. I had started to understand more clearly at that moment. Every “thing” word he used was an adjective. If I think of all the things as positive adjectives, my visit to Zunen could be better. Or if I speak as a Zunenian, “my visit to Zunen could be thing“. In fact, Zunen was literally the planet of the things. There was not any information about that in the Humok library in my last visit to Humok. Actually this was not surprising to me, because I knew that Humok’s drunkard librarian made the latest updates about 10 years ago. So it’s likely that Zunen had been transformed into the planet of the things in the last ten years. My host took me showing around the capital of Zunen for the three days I stayed there. I had the chance to eat Zunen’s most favorite foods and to drink favorite drinks. We also visited a museum with historical artifacts of Zunen. We couldn’t stay inside too much that day, because the museum’s closing time was very close. However, as I understand from the short tour in “The thing museum of Zunen’s thing history“, the Zunenians did not have much to do with historical artifacts. It was surprising that Zunen which has the livings’ history up to 80,000 years had no old artifacts. All the museum artifacts I could see were maximum 50 years old. That was confusing. But I was going to learn the cause of this after a long time; like in the same way I will understand better the headline of the newspaper I’ve read at first day I came here. The real reason I came to Zunen was, of course, because of a duty that the Galactic Council gave me. Three days later, I have left Zunen by completing my duty which I cannot explain what it was in here for certain reasons. After all, at the end of the three days I spent in a thing environment, it was not my job to interfere with some things other than my duty. However after I left Zunen, I’ve found the drunkard librarian on my 7th visit to the Humok library. I told him I wanted to see the last records of Zunen. Ultimately, he was supposed to have made the last update three years ago, according to my calculation at those days, and from library I was going to learn how Zunen turned into that thing anymore. The librarian first laughed loudly. Then he asked me when I went to Zunen. “According to end-component time spectrum activity of Universe Time Adjustment Center, it was more than 3 years,” I’ve said. This was an explanation he could understand for the information what he had to give me. “The situation is understood,” he said. And he told me that it would take time for me to read the latest informations about Zunen, but he could explain it briefly. Of course in return of a bit of mercury. I had come Humok prepared. After he took a sip from 2 gr of mercury that I’ve given him, he started to speak straight away. -Zunen planet rulers, who themselves were the richest of the planet, as long as there was a reaction against the administration on the planet, to prevent this, they first wanted to silence the press. They bought all the newspapers at first. They soon realized that buying newspapers was not a complete solution. Because after a while they saw that the newspapers that wrote the news they wanted, were unreadable. The broadcast channels they bought are likewise. Nobody began to follow the news of the lies. They also monopolized the single source of mineral fluid on the planet. And they gave it’s big share to a planet which was in the same galaxy and produced complete weapons also police robots. Zunen politicians said “With the police robots and weapons we will take in return of Zunen mineral’s share, Zunen would take control of public order and it would be a more peaceful place,” to the public of Zunen. Of course, it did not happen like that. -When you have been at there? -More than 3 years ago. -So you probably don’t know what happened three years ago and what happened next? -What happened to Zunenians? I wonder what it was! -If you give me more mercury, I’ll tell you what happened after you left there. Drunkard librarian gave me his last reply quizzaciously. But I didn’t have more mercury. Already I was always falling in his hook, line, and sinker. I used the mercury for another informations on my next Humok library visits. I still don’t know what happened next in Zunen. However, I am sure that a thing result occured in a thing envoriment in that planet of the things. I am happy, today, I am happy after a long time on this planet! A city in Turkey, yes, a city mayorship of Turkey was took by the Communist Party Turkey, TKP. I had shared with you in December 2017, Ovacik county municipality has ruled by communist party member Mehmet Fatih Macoglu with my post “Communist bees” you would remember. And that man, was the candidate of the city Tunceli where Ovacik in at today’s election 31 March! And he took the Tunceli city’s mayorship! He rised such a star from among many ugly politics! I want to cry!!! But I cannot, because of the extraterrestrial situations, as you know, our eye drops are not working too much. But if I had I would do! I was waiting until that moment. Right now, the vote boxes open 85% in Tunceli(Dersim). But the difference between his votes and the closer competitor, HDP’s candidate is about 4,5%. This is not a difference easy to close. So Macoglu took! You fly all red flags my earthling friends! I am happy, I am drinking vodka right now as you can guess, and this happiness I guess due to I felt real hope light! Nazdorovya! Haha! This will change many things I know! Salute you all my earthling friends and comrades! One of the city of Turkey will be ruled by Communist party after this! If it is happenning in Turkey, it can be in everywhere! Don’t lose your hopes ever!!! This order will change! Nobody has to live with this capitalist slavery order! And salute you Fatih Mehmet Macoglu proudly! Let’s fly all RED FLAGS today or tonight! I guess, I will edit this post tomorrow with sober head, whatever, haha! You can see at upper image where Communist Party Turkey has taken. I’ve put TKP symbol on Tunceli(Dersim), of course! What a wonderful feeling to do this, haha! Also, interesting results came today especially from Istanbul and Ankara. Istanbul and Ankara have been ruling by AKP for last 25 years. And today we can see that both city taken by CHP. The voters’ figures of Istanbul is about 9.3 millon, and Ankara is about 3,5 million. Both of their votes is equal almost another 10-15 cities in Anatolia. And such as Izmir (its voters about 2.9 millon), many city with a lot of voters especially at the shores taken by CHP in this election. I guess, these results will bring interesting period for Turkey’s political agenda in next days. There is another protest group in France, as well as the Yellow Vests. They are high school and college students. They are against the government’s reform plans on new exam system, and they want Macron administration to listen them. In short, it is in this way, but the content is very wide. To see the existence of freedom of expression is a lower probability than to see a dinosaur on the planet. On December 6th, during French high school students’ protests, the images of the French police who humiliated the high school students tyrannically, were imprinted on everyone’s memory. Even in the most fascist administrations in history, it has been seen rare that young people were treated in this way. It is said that France is now governed with democracy. The guns with plactic bullets and tear gas that are bought by the public’s paid taxes, are also part of this democracy. This is actually present in almost all democracies around the world. In the definitions of democracy, it is defended that people should have freedom of expression. But somehow to see this kind of freedom which cannot find an existence, is even less than the possibility of seeing dinosaurs on the planet. Of course, the group that wants to express themselves most often is young people inside the human kind. This is a situation that arises from the need more communication rather than because of the difficulty of expression of themselves. The youth in France abided by this rule. Even, at a point where the adults had to stand out in the name of them, they entered a big job such as to get the ropes into their hands. Student movements in the history of the world, far back to the very old dates. In the revolution of 1848, as in many European countries, students in France took part in the revolution movement. And of course 1968. The “Red May” of 1968 made forever Paris a symbol of youth unrest. Thousands of students from the best universities in France announced an indefinite strike under the slogans “It is forbidden to forbid!”-“Il est interdit d’interdire!” and “Be realistic, demand the impossible.”-“Soyez réalistes, demandez l’impossible”…Their protest inspired millions of people and became the subject of many books, films and songs. Many teachers sympathized with the students, including the famous contemporary philosophers Michel Foucault and Jean-Paul Sartre. Student revolt against bourgeois society and bourgeois morality spread to the neighboring European countries. As it turns out, these protests of French students are not the first and have a very old history. It can even be said that these protests are much older than the beginning of Marvel Cosmic Universe (1939). Well, are there any a hero or “villain” and “supervillain” in these youth movements? What do they oppose and what do they want? I’ve read an article about the French education minister’s concern in the education system. Quoted from the article dated December 2017 as follows. “It follows an announcement by Jean-Michel Blanquer, the French education minister, that mobile phones will be banned from next year in primary, junior and middle schools, a pledge that formed part of Emmanuel Macron’s presidential campaign. As you can see, this concern is about the use smartphone/mobile phone of young people. And he describes it as “an educational point of view, that’s a problem,”. Not only young people, but almost every person has these phones in their hands and they can’t keep their eyes off them. This is already a ridiculous situation for all humans. However, while students obviously have a lot of problems, like not being able to get education at first, Jean-Michel Blanquer, the French education minister’s doing is to play to the audience. These young people do not want Jedi education, they want only the right, accessible and equal education for all. Of course it would be cool if they had Jedi training. Give these young people what they want; I’m sure when you give, the use of the smartphone which is a big problem, will be reduced at least half! Also, if Macron government had been sincere that smartphones were the problem for human health, they would not have announced that their goal is rollout of 5G in 2020. 5G brings the smart meters next to itself. Smart meters will not harm children, young people, adults, even the nature, ie the health of the whole society? But it is okay for you. A few billionaires would put more satellites into space, space would return to the more dumpster, government allowance would give to these billionaires, money would allocate from the budget for them, more tax burden will be on the people’s back for the profit of rich people, the phone manufacturer billionaires would sell new 5G compatible phones. It doesn’t matter the people’s health is jeopardized, next to so many rich get more profit. Let’s you admit, you are hypocrite! However, they think that this generation called Z Generation, because of their navel cords were cut through the internet when they were born, they will swallow and digest whatever they are given about internet technology and on internet. “Already these teens share stories in instagram, they tweet and swear, laughs at videos that goats shout at each other, even they watch the game players instead of playing game, shortly waste their time without thinking.” These are not my thoughts. This is how most managements see Z Generation in general. Well, they all are really like that? In fact, these researches show differences on the country basis according to social media researches. For example, Z Gen of US and Z Gen in France have not the same internet addiction. But generalizations on this planet, sharp-edges are very common. In more detail, while more than 90% of American Z Generation spend time on the internet, in France this figure is in the 63-65% range. The trend in internet sharing is not the same either between them. I didn’t do these researches. The companies that make these researches are the marketing companies that focus on young people. Their aim is, of course, to identify and direct the tendencies of young people, and in this direction, to make profits that they can manage within the capitalist system. Are these young people, Z generation, really a marketing tool, so are they handy fools? In the meantime, why Z generation, why did we come to the last letter of the alphabet, will there be no other generation after that, why…? Hundreds of questions in my head. Anyway. These teens show in a way that they’re not handy fools. If they are, some organizations in the world would not do research on the tendencies of socialism for both Millennials and Z Generation. I’ve thought about that too, of course. :) That’s what I realized: Generation Z was born in the period when the environment was polluted the most and this was done by capitalist companies plainly visible. On the other hand, perhaps they are lovers of animals and nature more than any other generation. In the surveys, a business that is intertwined with nature in the field of expertise/work for which they think in the future, is at a high rate with the work of information technologies. This, of course, is not only because of they are bored very quickly and want a job outside. They want to live in a clean environment, want to breathe. By the way, the condition of your planet is really bad; I should specify that the alarm level is even black. The planet earth with this polluted environment is as important as the Internet for Z Generation. In other words, we can say that, in fact, capitalism could not get the full result as it expected on them. However, the capitalism tries every way to achieve the goal. Capitalism is a system that makes ordinary people even worse poor, making the rich even richer. Perhaps the protests of these young people and the yellow vests can be compared to the Rebellion of Poor France. However, the definition of poverty is a different color for each country. The price increases especially in 2018 put the laboring French a difficult situation. This difficult situation determines the living conditions of French people. It would not be right to make the same definition in other countries. In other words, the definition of poverty varies according to each country. Capitalism offers you a different type of poverty according to the conditions in each country. It is up to you to choose and like or not. If you do not accept one of the definitions of poverty, in this time you faced with police forces that the government has grown up with its hand, and their costs paid with your taxes again. These advanced camouflaged and armed police forces seem to have evolved as a new species. This new species, which will be called Homo robotus, has evolved until it reaches this level. Find 10 differences between two pictures. There is no need 10 differences! At the first a young could talk to the police while laughing and at the second, a teenager is on his knees on the ground with his hands behind his head; in front of him there are 35 police officers I can count. Like a horror empire! In 50 years France has really made a lot of progress on human rights! In the last fifty years, of course, these new police forces, evolving as Homo robotus did not jump over the time by disrupting the rules of evolution. According to wikipedia, in the last 50 years in France 17 riots have been. If you ask whether the police violence still continued or not after this news, yes, of course, is this question a joke? For more details of the violence of the Homo robotus of France government, it is enough to take a look at these two articles. Would Sartre, Hegel or Khayyam play World of Warcraft? It is now overwhelmingly on the planet, there are limited, even non-freedoms, the hegemony of capitalism, police violence, wars and interventions, a polluted environment. Under these conditions, young people want to step forward and shape their future. It is already the ideal one. The adults should not make judgments without hesitation, while sitting on the chair. Okay, this generation has a lot of shortcomings, but which generation hadn’t? Wouldn’t every new generation always tagged by the previous one? I think the most important problem of this generation is their importance to the visual perceptions. Communication is usually provided on social networks on the internet through photographs or similar visuals between them. So time is short for them; they spend this time for watching, not to read. Visual perception is open to manipulation. Without knowing what is really in the background, a watched video can cause war cries against a person or group who does not deserve at all in the room. Of course, these young people will look for answers of the same questions over time as same as the adults did before. “Why am I here?” is the first one. Who didn’t ask this question? Many philosophers have tried to find the causes of human and all existences on this planet. But if they had lived today, or if they themselves were Z generation, for example, Hegel, Khayyam or Sartre, would they give the answer to this question via twitter? Or maybe they would become youtubers. Or maybe they would play World of Warcraft. I don’t think Sartre or Khayyam would play WoW, but I think Hegel would have played. He had got that light. ;) Even when playing, Hegel could have raised a new idea and said “Virtual reality is rational, and rational is virtual reality,” haha! As a result, present youth in France will also criticize the next generation. Due to we came to the last letter in the alphabet, probably the next generation will be called something like Version Z2. Of course, nowadays they have a stance against the system and they will have the right to criticize the next generation. While they are taking part in all these struggles, adults have to give up on promises to them with empty words and feel the same fear for the future of human and the planet. Both are already connected with each other. For now, there is no other planet where the human species can live. For that reason, if there is a will in a anywhere, they may be in young people even children, adults need to take their side. In the end, it should be remembered that the future of humans is belong to the youth with free mind and free conscience. (*)I’ve tried to get in touch with their union to learn exactly what their demands are about 2 months ago. I had thought to make an article about them. Because in the English-speaking world, it is very difficult to find articles about the struggle of French high school students. But, I had to postpone a lot of things, including this article, because of ear infection I had last month. Also yes, the high school students in France have got the union, UNL-SD (Union Nationale Lycéenne – Syndicale et Démocratique), you did not hear wrong, my earthling friends. (By the way, we don’t even have an union, I envy you!) However I do not know French. When I tried to contact with them(union members), probably they didn’t understand what I asked. I only know three of the world’s languages, and all three are half-way I guess; but I can handle in a way as you knew my earthling friends. ;) I think they were naturally suspicious of “why an extraterrestrial ask these questions to us” in justified. On this planet I’m an observer for the Galactic Council that these young people have no idea. I hope that after this article, they will realize that I am not here to invade the planet earth and my goal is peaceful. Of course, they can always comment on this blog, they’d like to add something if they want to add or connect with me. Of course not only members of the union, it’s open to everyone who participates in the protests and says “there’s something I want to say.” You all welcome. HAVANA (Reuters) – Cuba said on Thursday the United States was moving special forces closer to Venezuela as part of a covert plan to intervene in the chaotic South American country using the pretext of a humanitarian crisis. A “Declaration of the Revolutionary Government” alleged that recent events in Venezuela amounted to an attempted coup that had so far failed. U.S. President Donald Trump’s administration has been trying to pressure Venezuelan President Nicolas Maduro to step down and hand over power to Juan Guaido, the head of Venezuela’s National Assembly. Guaido invoked a constitutional provision to assume the presidency three weeks ago, arguing that Maduro’s re-election last year was a sham. These events, the declaration said, had led the United States to impose drastic sanctions causing damage “1,000 times greater” than the aid it is trying to force on the country. “Have you ever felt the future is the past, but you dont know how…? -Damn you Migo! So, you did read my horoscope from Zaytung! I knew that something was wrong on it! And you are telling these to my beloved followers, my dear friends! How dare you! -I cannot be calm down Migo! Do you know how much I was ruined when I thought that I have lost all invites for open buffets, all good foods! My sorrow is not a joke! -Okay. Do you want to listen what your real horoscope sign tells? -NO! I do not want! You can foolish me again! -I will not do in this time. -No Migo, you broke my heart! -Are you sure you don’t want to listen. It is really good things are written. Even it says that a new love could be seen in 2019 for you, a special one. -All right, just in this time, you can read. But only this time. I am still angry, but I can forgive you just in this time. It’s not because of that I’m curious about my new love; it is because of I am a dog with very big heart! And, WD and I wish to all you healty (as mind and body:)), peaceful and happy new year with your loved ones! Mutlu Yeni Yıllar! — С новым годом! — Happy New Year! Aaare youuu readyy for the new episode of Russia&Ukraine dissension! Ladies and gentlemen, this match is scheduled for one fall and for the Holy Churches Championship! Introducing first from Russian Orthodox Church on the red corner, in heavyweight. And, introducing the challenger from Ukranian Orthodox Church on blue corner, in middleweight! Please welcome both! Are you ready for Holy Glory! The incident occurred in 06.12.2018 in the village of Vinyantintsi in the Ternopil Province of Ukraine. The fight broke out when “Archbishop” Tikhon Petranyuk of the Ukrainian Autocephalous Orthodox Church entered the church during a service to read out a decree banning the “priest” John Boikoof the Orthodox Church of the Kiev Patriarchate from serving. The clergymen who cannot share the church have fought and punched with each other in the front of the citizens who came for worship to the church. The Archbishop who began to read the decision about the Priest Boikoof by entering the church even though the people closed the door on him, faced the reaction of the people. When the Archbishop’s wand was broken, the trouble was stired up in church. The priest who had concussion of the brain and fractured his rib was taken to hospital. The incident took place before the unifying council meeting in Ukraine on December 15th, with representatives of all Orthodox churches. When you have read the first lines of this post, you have thought probably “Our extraterrestrial friend Migo is making humor again.” 😃 But I did not make my earthling friends; when everything was so clear, it was not need to, haha! While there is a fight, a broken rib and brain concussion in the middle, the scenes are not different from boxing ring. Even we can say that boxing ring is more fair than these. Already we all know that after the last moment in the boxing ring, there is a winner of the match. But in this events, so in the churches’ events there are many politic conflicts and unknown things in background. We can only filter some of them in our views. However, we can still use the similarities to evaluate the fighting of churches in terms of boxing. Is Russian Orthodox Church on the ropes? Who tries to throw his hat into the ring? “I hope that despite the current opposition, the Ukrainian Church gets its independence status, which is their right, soon,” Bartholomew said in a speech he made following the Sunday church service held at the Saint Fokas Orthodox Church in Istanbul’s Ortakoy neighborhood. Bartholomew said that the Istanbul-based Patriarchate granted independence status initially to the Russian Church in the 16th century and then lastly to the Orthodox churches of the Czech Republic and Slovakia in 1998, state-run Anadolu Agency reported. 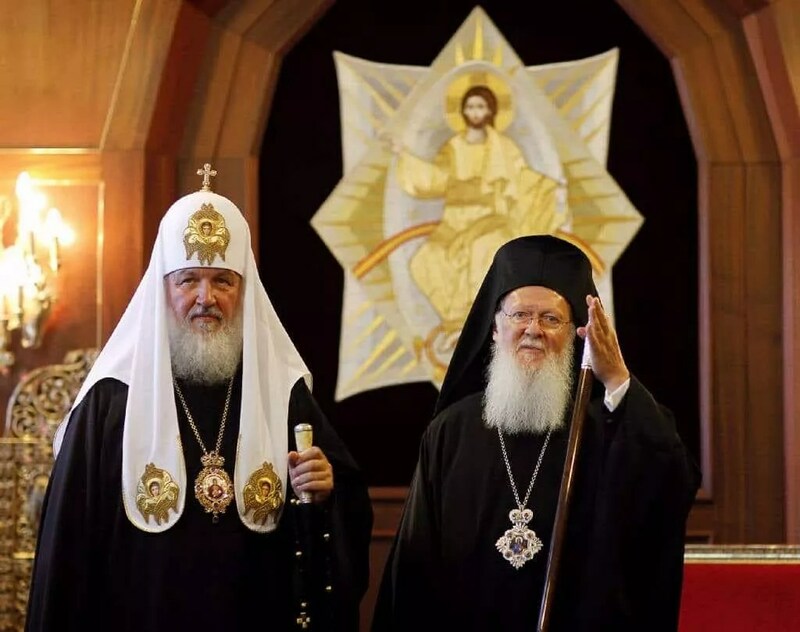 The Ukrainian Church wants to have “ecclesiastic independence” from the Church of Moscow and all of Russia but needs the approval of Bartholomew, since he is recognized as ecumenical by all other Orthodox churches. The Ukrainian Church is split between a branch whose clerics pledge loyalty to Moscow and one that is overseen by the unrecognized Kiev-based Patriarch Filaret. The fracture has deepened following a four-year conflict between Kiev and Russian-backed rebels in eastern Ukraine and the Russian annexation of Crimea. Earlier this month, Bartholomew sent two representatives to Ukraine, leading an incensed Russian Orthodox Church to cut ties with the spiritual leader of the world’s Orthodox Christians at an emergency meeting on Sept. 14. As it is understood, whereas it needs to be the Patriarch of Constantinople should be unifying all the orthodox churches, on the other side he is making statements to Ukranian church such as “seperate from Russia, I support you”. I think he wants this merger “under its own roof”. 😎 He could envy the Pope, the spiritual leader of the Catholics? Of course, Pope is almost a movie star! Even he has a profession where he earns a lot of money more than the Hollywood stars in every his steps on the planet. And all the shimmering gigantic outfits! Yeah, that could be jealousy, haha! Can Russia roll with the punches? According to Sputnik news, Bartholomew, who accused the Russian Orthodox Church of interfering with the works of the Fener Greek Patriarchate, said, “The priest from Moscow was sent to serve in the church at the Consulate General of Russia in Istanbul. It is illegal, because this church is spiritual and belongs to legal Fener Greek Patriarchate”. “-I am your father, not him!” “-No, I am the father of all of you, not him! “-No, no, I am”, “-Nooo, I am,” and goes on like that. 🙂 I think someone needs to make paternity test, and all world can be relief, haha! Which one will lead with its chin? December 15, 2018. Ukrainian Orthodox leaders have agreed on the creation of a new national Orthodox church and elected a leader to head that church, a move that Ukraine’s leaders say is vital to the country’s security and independence but could raise tensions further with Moscow. Ukrainian President Petro Poroshenko said 39-year-old Metropolitan Epifaniy of the Kyiv Patriarchate church had been chosen as head of the church by a council, comparing the move to Ukraine’s referendum for independence from the Soviet Union in 1991. “This day will go into history as a sacred day…the day of the final independence from Russia,” Poroshenko told thousands of supporters in central Kyiv on December 15. “And Ukraine will no longer drink, in the words of Taras Shevchenko, ‘Moscow’s poison from Moscow’s cup,'” he said, quoting the country’s national poet. Poroshenko said Ukrainians finally had their own Orthodox church. 16.12.2018, MOSCOW (Sputnik) – The Ukrainian Orthodox Church of the Moscow Patriarchate (UOC-MP), the only canonical Orthodox church in Ukraine, refuses to recognize the structure created on Saturday in Kiev at the “unification council”, Archpriest Mykolay Danylevych said. “The schismatics remained schismatics, and the Church remained the Church. It was joyful and gratifying that the bishops, clergy and believers remained loyal to the Church. The Church has manifested its unity. It is regrettable that there were few ones that went into schism, and also that this schism was supported by the Patriarchate of Constantinople. But no matter how hard they tried to proclaim the schism as the Church, and non-canonical as canonical, the Body of the Church of Christ will not accept this, because the structure that was created yesterday was and is an extraneous body that is rejected and not accepted by the Body of the Church,” Archpriest Mykolay Danylevych, the deputy chairman of the UOC-MP Department for External Church Relations (DECR), wrote on Facebook Sunday. Following the unification council, the Estonian Orthodox Church of the Moscow Patriarchate (EOC-MP) also did not recognize its results. Metropolitan of Kiev and All Ukraine Onufriy was and remains the legitimate head of the Ukrainian Orthodox Church, despite the creation of the “new church” in Kiev, spokesman for the EOC-MP Archpriest Daniel Lepisk said. “Metropolitan Onufriy as he was and remained for us the legitimate head of the Ukrainian Orthodox Church, and in this respect, nothing has changed for us. These ‘churches’ [organizers of the ‘council’] were considered schismatic even before that. From the fact that instead of two old churches they created one new, the essence has not changed,” Lepisk noted. Is there a way of one of them would throw in the towel? I do not think so, my earthling friends. These are big issues. Even if the audience of the match is waiting for the result with excitement, this match will take longer. I do not expect any physical conflict on the field until the weather gets warmer and the season terms are better in the region. 🙂 Of course, I don’t think either the parties are going to idle around in the meantime. There will be bargains in the background. They will do what they can corner the opponent. We can assume until that time what will happen in politic future between west and Russia by following churches’ movements. Like “follow the money”, haha! After George Herbert Walker Bush died on Nov. 30 at age 94, the mainstream press favorably contrasted him to Donald Trump, portraying the former Republican president as “kinder” and “gentler,” two watchwords from his inaugural speech. But, Trump’s signature aggressivity towards immigrants is epitomized through extra-territorial interception and imprisonment and separation of families, brutal policies which were, in fact, pioneered by Bush I during the Haitian refugee exodus following the Sep. 30, 1991 coup d’état in Haiti. As we saw in this series’ first article, George H.W. Bush’s administration gave manifest and tacit support to dictator Prosper Avril (1988-1990) and to the first coup d’état against democratically-elected Pres. Jean-Bertrand Aristide. As a result of that putsch, tens of thousands of Haitians took to the high seas in small boats, many fleeing for their lives. In the first year after the coup, the U.S. Coast Guard intercepted some 38,000 Haitians in international waters. U.S. interdiction of Haitian refugees had begun in September 1981 under Pres. Ronald Reagan, for whom George H.W. Bush was vice-president. Under the rules laid out by Reagan’s Executive Order 12324 titled “Interdiction of Illegal Aliens,” Immigration and Naturalization Service (INS) agents on board U.S. Coast Guard cutters were supposed to interview and “identify candidates for asylum as political refugees under United States and international law,” explains University of Miami law professor Irwin Stotzky in his new book Send Them Back, about the efforts of crusading lawyers (including himself) on behalf of Haitian refugees during the 1980s. The screening process was laughable, with interviews which were not private and as short as five minutes, while the snatched-up “boat-people” were often hungry, thirsty, scared, and confused. Haitians lived in hundreds of tents at Camp McCalla at Guantanamo under the George H.W. Bush administration. “As a result of these defective procedures, only 28 of the approximately 23,000 Haitians on vessels interdicted by the Coast Guard from the inception of the interdiction program in 1981 until mid-1991 were identified by INS officials as potential asylees,” Stotzky writes. During Aristide’s eight months in office in 1991 (Feb to Sep), there was a net human influx back to Haiti, as thousands of joyful expatriate Haitians returned to their homeland to take part in a new democratic experiment after three decades of dictatorship. But the 1991 military coup cruelly cut short that hope-filled period and provoked a new refugee wave which overwhelmed the U.S. Coast Guard ships stationed off Haiti’s coast. As a result, the Coast Guard began transporting Haitians to the U.S. Naval base at Guantanamo Bay, Cuba, housing them in giant hangars and Camp McCalla, a makeshift city of hundreds of tents set up on Guantanamo’s paved runways and loading docks. At its peak, there were over 12,500 Haitians detained there. After eight months, the Bush I administration finally dropped all pretense of giving Haitians any due process and discarded the Reagan-era screening protocols, as imperfect as they were. “On May 24, 1992, claiming there were too many Haitians coming, Bush ordered the Coast Guard to intercept all Haitians fleeing in boats and immediately return them to Haiti, without interviews to determine if they were at risk of persecution or death,” Stotzky explained to Haïti Liberté. Beginning in 1991, “when the U.S. detained Haitian refugees indefinitely, it set a precedent,” concluded Prof. A. Naomi Paik in a comprehensive article last June about Haitians at Guantanamo on the website The Conversation. This was the beginning of Guantanamo being used as a prison, for which it would become even more famous in the early 2000s after it was used to hold, in legal limbo, prisoners swept up in George W. Bush’s wars in Afghanistan and Iraq. These Haitians had been found to have plausible claims for political asylum, but they were barred from entering the U.S. because of their HIV status. Hundreds of children were interned in the larger Camp McCalla, and at least 25 children went through Camp Bulkeley. George H.W. Bush’s Attorney General William Barr presided over what has been called “the world’s first HIV detention camp.” Today, not ironically, President Donald Trump has nominated Barr to be Attorney General once again.